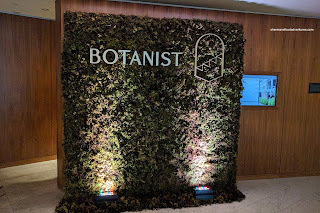 To be honest, it has taken me this long to finally dine at The Botanist for an actual sit-down meal due to one reason - there was just too much hype going on from their initial launch. I had attended the media event where nearly every single person was invited, but really didn't get a sense of the food due to massive crowds and not being able to try any whole dishes. So after all the social media buzz began to die down, Viv and I went on a quiet weekday to check out their current menu. For our appetizers, we had the Pan-Seared Scallops and Charred Octopus. Neatly plated, the scallops sat atop a madeira jus that was silky and mild. The buttery scallops were beautifully caramelized on the outside and adequately seasoned. It was topped with a thin slice of guanciale that added a slight saltiness while the green apple contributed a tangy sweetness. 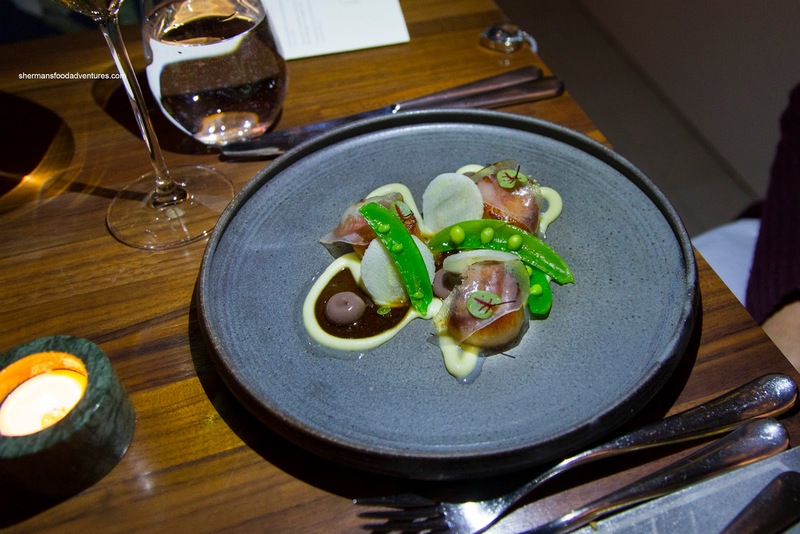 This was a balanced and composed dish. 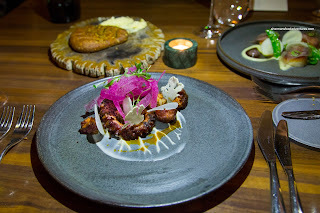 As for the octopus, the char was on point as it was smoky and firmly crusty on the outside. The depth-of-flavour was evident as well as salty spiciness of the chorizo. We found the octopus on the chewier side although it was far from being too firm. The rest of the ingredients including watermelon radish, cauliflower and kohlrabi were beautiful to look at, but were merely a garnish. We would've liked to see them pickled for some acidity. For our mains, we dove into the Herb-Crusted Lamb Saddle first (at least I did, because Viv doesn't really prefer lamb). It was pretty clear that the meat was expertly prepared being medium-rare and tender. I didn't notice the herb crust though. The meat itself could've been seasoned more aggressively as it was a bit bland on its own. 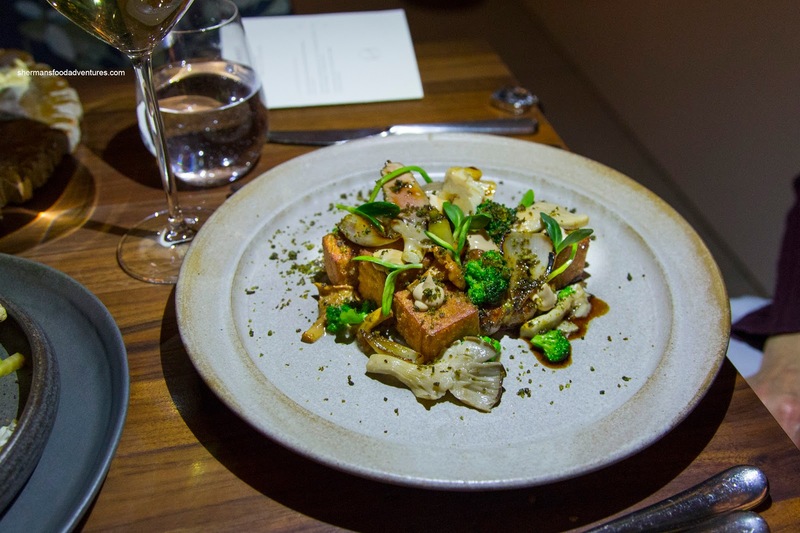 Hands-down, the best item on the plate was the fluffy panisse as it tasted great with the garlic really came through as well as the taste of caraway. Loved the tart mushrooms as they brightened up the dish while the burnt shallots added aroma and sweetness. Uniquely plated with a side of fermented vegetables in a puffed tapioca cup, the Seared Sablefish was also on point. Perfectly crispy and seasoned on top, the rest of the fish was flaky and buttery. It rested on an onion nage which was an excellent compliment as it was bright, light and naturally sweet. 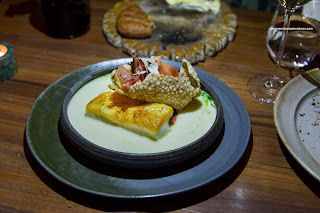 When eaten with the tangy veggies, the flavours were balanced. 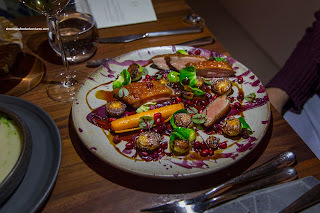 Hands-down the best dish we had was the Duck Breast with winter squash, pomegranate, brussels sprouts and natural jus. Crispy and completely rendered, the skin on the duck couldn't have been any better. Furthermore, the duck was served medium-rare being succulent and tender. The combination of pomegranate and jus was the perfect marriage of sweet and savoury. Wrapped in a carrot cannelloni, the squash was nicely spiced with the usual nutmeg, cinnamon and cloves. 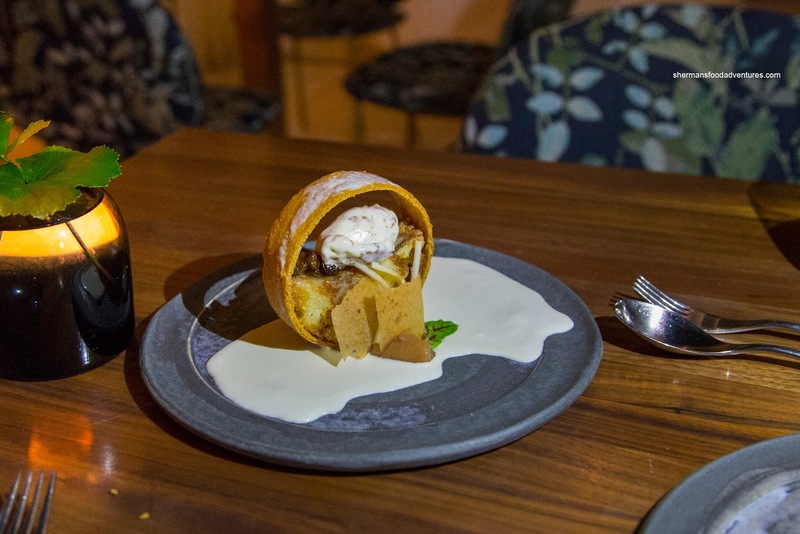 For dessert, we had the stunningly presented Croissant Perdue with graham cookie ice cream, apple, raisin compote and calvados mascarpone drizzle. The combination of ingredients yielded familiar flavours that were complimentary and purposefully sweet. Loved the light booziness and sweetness of the drizzle. 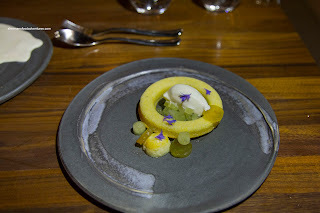 We also had the Meyer Lemon Polenta Cake which was pretty firm but understandable given the ingredients. It was refreshing though with a nice tanginess to balance the sweetness. Loved the apples as they added a sweet tartness to go with the honey, angelica brulée and lemon buttermilk ice cream. I especially enjoyed the angeica brulee as it added a hit of tanginess. 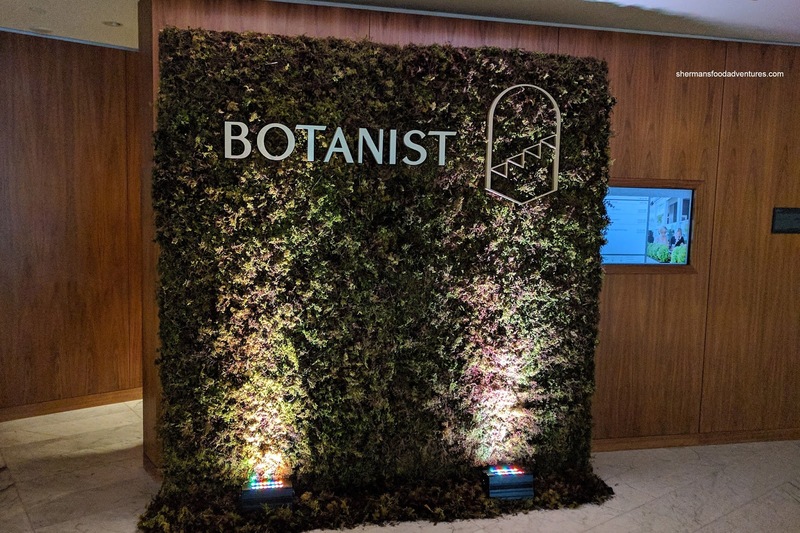 From this experience, we agreed that the Botanist is a great replacement for departed Oru. Food and service were good, especially for a hotel restaurant.